We’ve all heard some version of the phrase “heat rises” but is that really true? First, we need to remember that heat is energy not matter. Heat is a force not a thing, so while heat may result in changes to matter (stuff) it, isn’t matter itself. When we add heat to stuff the molecules inside move faster and when you remove heat molecules move more slowly. So no, heat cannot rise because heat isn’t a thing. Hot air, on the other hand, does rise in colder air. We see that when we heat the air in a balloon it will rise and float in the colder air around it, but why does this happen? It all comes down to density and buoyancy and we see it all the time in water. When something is less dense than water it will float upward and when it is more dense than water it will sink down. Even water changes in density with changes in temperature and will sink or float depending on the differential of one mass of water compared to another. Colder air is denser (more lbs per sq ft) than warmer air. So colder air “sinks” in warmer air and warmer air “floats” in colder air due to buoyancy just like hot air balloon floats in the air or a rubber duck floats in a bathtub. When you add sensible heat to air the molecules in the air begin to move more quickly and they start to separate making warmer air less dense when the molecules are free to move. When you remove sensible heat from air the molecules slow down and the air becomes denser. But that isn’t the force at play in air and heat movement. We ALSO know that heat tends towards equilibrium or “hot goes to cold” so that when a cold air mass hits a warm air mass and they start to mix the heat from the warmer air will start to enter the colder air creating an equilibrium. Then we also see that pressures also tend towards equilibrium or “high pressure goes to low pressure” which also impacts air movement. Because air is relatively free to move in a building you will observe all of these forces at play at once with some of the dominant forces being stack effect in the winter and reverse stack effect in the summer. When you increase the temperature of air in a space through a heater the density of that warmer air leaving the register will be lower than the colder air around it. This will result in the warmer air “floating” in colder air and the colder air “sinking” below the warmer air. As that warmer air continues to rise it will naturally create a lower pressure near the floor which will tend to draw in cold air from outside through any gaps lower in the home. 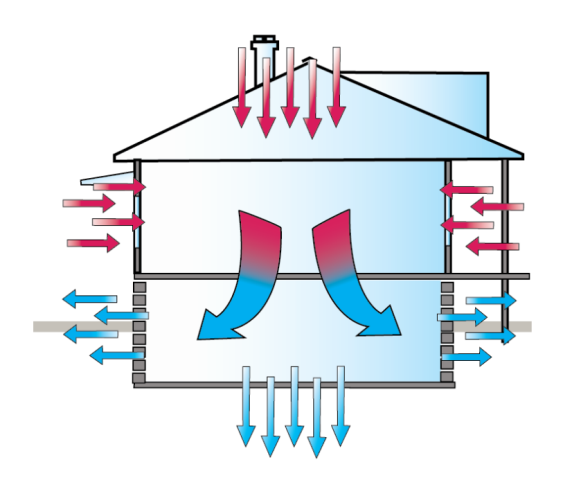 This is what we often refer to as “stack effect”. In the Summer when the air is cooled, the cooler air will sink in the warmer air creating a lower pressure near the ceiling that will tend to bring in heat from gaps higher in the structure such as can lights. Again… there are many factors that impact the movement of air in a space and stack effect is only one of them and is based on buoyancy. For example, imagine a roaring open fireplace on the first floor of an old leaky home. As that fireplace heats the air, air begins to rush up the chimney. This creates a low-pressure area in front of the chimney and air from all over the home pulls into that area to fill the void (high pressure goes to low pressure). At the same time, the fireplace is heating the room it is in (mostly through radiant heat) and the heated air starts to float in the colder air. In the meantime, the entire house is going under negative pressure compared to the outdoors and cold air is being drawn in from gaps and cracks all over the home. In other words…. Air is tumbling and mixing all over attempting to balance the forces of pressure, temperature and buoyancy due to the simultaneous increase in room temperature and a decrease in room pressure caused by the open fireplace. So heat doesn’t rise, hot air floats in colder air and cold air sinks in warmer air and there are many other forces at play.